Review: My Beauty Diary - Sake Yeast Mask | Memorable Days : Beauty Blog - Korean Beauty, European, American Product Reviews. 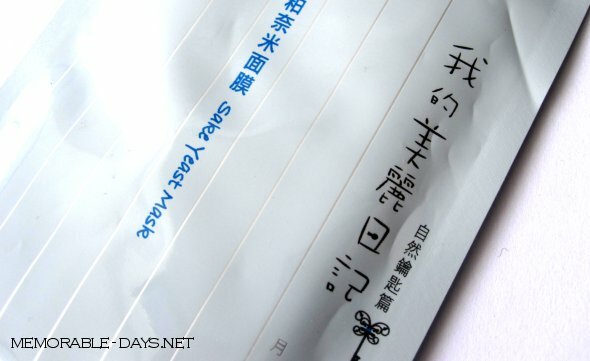 I received a Sake Yeast mask of My Beauty Diary (我的美麗日記面膜) the other day. I hadn't tried this one yet so I was excited to try it out ^___^! This mask is for people with a normal skin. - Plant collagen: maintains regenerating and repairing functions of skin. It offers a whitened, bright, translucent and flawless look. It's also moisturizing, smoothing and firming. One box comes with 10 individually sheet masks. On the box there is a small sake bottle. This mask is individually packed into a light blue foil wrapping. You only need to tear the mask open and unfold the sheet mask. Like all of the other MBD sheet masks, there is a plastic sheet folded into the sheet mask. Throw the plastic sheet away. It's a thin cloth, it's wet and it remains that way even after the 30 minute mark. Besides, it absorbs into your skin nicely without leaving any sticky feel behind. I had read a few reviews before I got this mask and a lot of bloggers said that they didn't like the smell. This is definitely the smell of SAKE! However, there is no alcohol in this mask, so don't worry ;). If you don't like the scent of sake I wouldn't try this one. I'm not a big fan of sake, but I don't hate the scent of it either. The size of the mask is different than the other My Beauty Diary sheet masks that I have tried. (I took a picture of the mask when it was dry, see below.) It's wider compared to the other ones and the length is shorter. 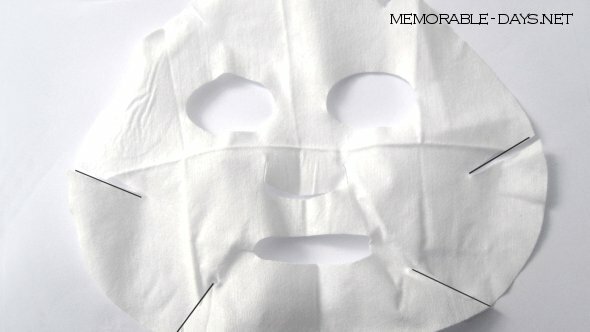 You can compare it with the other mask here: http://www.memorable-days.net/2010/12/my-beauty-diary-natto-sheet-mask-review.html. Clean your face and pat it dry. Unfold the sheet mask and put it on your face for 20-30 minutes. The sheet mask felt refreshing and moisturized. When it's time you gently massage the excess tonic on your face and wait till everything is absorbed. Don't need to rinse it off. Follow with your usual moisturizer / serum after. I didn't like the size of this mask, it was a bit too wide and the length is shorter, so it didn't fit my face. Besides, I'm also not a big fan of sake. However, this mask does what is says. I could see instant brightening and an even skin tone! Besides, my skin didn't feel sticky after usage which is good ^__^. It's overall a good mask, I definitely recommend this to people who like the scent of sake and this is a good mask if you want to brighten your face!